Today, for a limited time only, I’m putting the Cosmic back into Cosmic Revolutions. And that means we need to scale up! Normally I talk about the future on a human scale. Technology we’ll see in our lifetimes, say, or maybe a few generations later. The wildest, most speculative ideas might push that envelope out to centuries or a millennium. But today we’re looking at Earth’s future on a cosmic scale, so the numbers in the rest of the post are all in billions of years. (That’s 1,000 x 1,000 millennia, for those of you keeping track at home). I know what you’re thinking, and the answer is no: there’s no guarantee humans will even be around that long. But we’ll get to that in a moment. What follows is a brief tour of the future, from the perspective of our very favorite planet in all the known universe. I’ve thrown in some past events too, just to give a sense of the proportions. 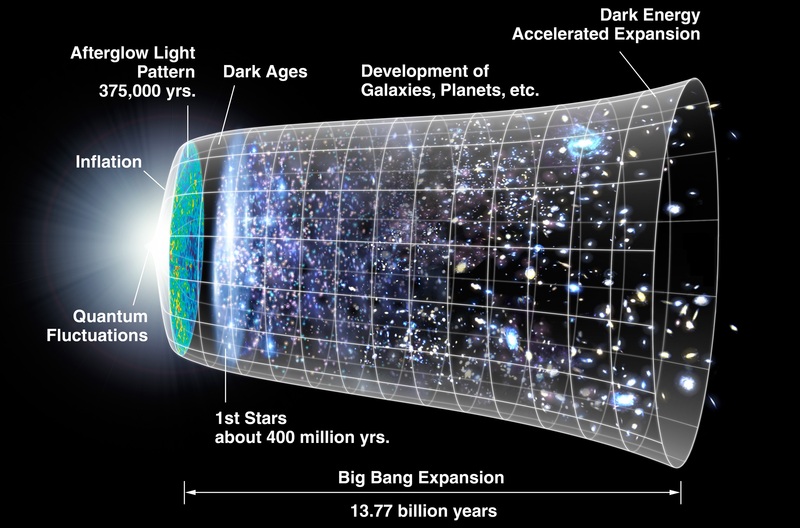 13.7 billion years ago – The Universe is born. An incomprehensible singularity just up and explodes, simultaneously creating space and time, plus a whole bunch of matter to seed it with. These are the raw materials that will eventually become stars, humans and hot dogs. 4.5 billion years ago – Our Sun is born. A cloud of molecular hydrogen and dust grows just fat enough to collapse under its own weight. The resulting ball of matter is so pressurized that it starts a spontaneous nuclear explosion in its core, an explosion that is still happening today. A fraction – just 2% – of the matter swirls about in a disk instead of joining the star, and eventually agglomerates into 8 planets, a gazillion asteroids, and whatever Pluto is these days. 3.5 billion years ago – Life appears on planet #3. We’re a little fuzzy on the details, but theories range from lightning to aliens. 1/100,000th of a billion years ago, a.k.a the proverbial blink of an eye – Our own story begins. Some clever homo sapien somewhere plows a seed into the soil, and human civilization takes root. 0 years ago – It’s today, and here you are, reading this blog post. 1/4 of a billion years from now – Tectonic drift has shuffled the earth’s surface so much you wouldn’t even recognize the continents anymore. One current theory suggests a “Pangaea Ultima,” a single supercontinent. Check out the page here for a great animation. 1 billion years from now – Our ever-hungry sun has consumed the hydrogen in its core, and has begun to cannibalize its own shell. More nuclear reactions = more heat. How much more? Let’s just say that if humanity’s still around, we’d better have established some interstellar moving companies by then. 3.5 billion years from now – The last of Earth’s oceans boil off into space, finally rendering the climate change debate entirely moot. The planet will be one huge desert for the rest of its days. 4 billion years from now – The Andromeda galaxy (which, I neglected to mention, has been hurtling toward us at 112 kilometers per second this entire time), finally collides with the Milky Way. Click here for an incredible front-row view of the spectacle. The solar system survives (…probably), but is likely tossed to the fringes of the new combo galaxy. Or ejected into deep intergalactic space – imagine a night sky packed with galaxies, but not a single star. ~6 billion years from now – Thanks to the extra heat, the sun’s been expanding, and it’s now a full fledged red giant, with a radius perhaps 200 times larger than today. That’s more than enough to engulf Mercury and Venus, and most likely Earth as well. Sad to say, that’s the end of the story for this little blue planet of ours. It came into existence as a lump of molten rock alongside the sun, and will go out exactly the same way. But wait… is this the end of our story? Not necessarily. Sure, humanity might dissolve itself in a shower of nuclear bombs by then. Or human-induced climate change might roast us all, beating the sun to the punch. But suppose we defy the odds. Suppose we successfully hack civilization all the way to the year 1,000,000,000. What do we do when our planet gets french-fried? Well, I’ve heard Pluto is nice this time of year! One of the most intriguing implications of the sun’s expansion is that although the “habitable zone” will have moved far beyond earth’s orbit, it will by no means disappear. In fact, temperatures in the Kuiper belt (the dark, distant backwater of the solar system) might be comparable to those on Earth today. And we know there’s water out there, in the form of ice chunks and dirty snowballs. Place needs a little cleanup and a fresh coat of paint, but it might not be a bad place to start over. Of course, I’m never going to find out what happens, and neither are you, barring some incredible advance in immortality research. But I like to think that in the far future, there will be at least one human still around to observe Earth’s final farewell, and perhaps shed a nostalgic tear on her behalf. If you like this post, tell your friends using these buttons. Or share your own thoughts using the comment box below. Tags: astronomy, end of the world, far future, space travel. Bookmark the permalink. Nice! My $ is that we will blow ourselves up or a collision will wipe us out before the year 1B but I’m hopeful that there are enough smart ones amongst us to get us off the planet so that we can start populating beyond Earth. Either way, I sure would love to be there to see the end of the Sun (right before I was evaporated). 🙂 Great post as always Scott. Hmm… we’ve all got to go sometime. At least being evaporated by the sun would make for an impressive story! Many thanks for reading and sharing your thoughts. (And for anyone else who’s interested in space, the future or humanity, I highly recommend Jason’s blog at wiredcosmos.com). Coming from someone who’s read basically every single one of my posts, that means quite a bit! Thanks for reading, and for sticking around. I agree with Brad—one of your best! When we consider with the lenses of geologic time frames, we bring a cosmic perspective, fueled by our human imagination and our capacity for bringing data to the questions. I remember once driving to work, many years ago, feeling consumed by workplace concerns, and listening to NPR. Heard a report that the core of the earth is rotating at a different speed than the crust of our planet and that this means inevitable planetary destruction in a distant future. I immediately relaxed about my immediate problem–something beyond my worry was available to set it in context…a cosmic perspective. Hope you’ll keep writing and exploring these questions for us to ponder. I agree, perspective is a crucial tool for putting our problems (or anything, really) into context. I’m glad this post was able to do so. And I’m really glad you’re part of the conversation!